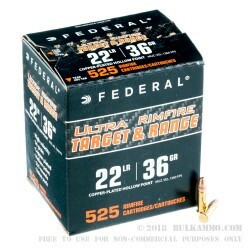 This 5250 round case of 22 LR ammo by Federal Ultra is an affordable way for high-volume shooters to enjoy the versatility of this classic caliber. 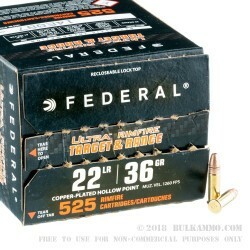 This Federal Ultra ammo is perfect for long days on the range or for backyard plinking, but the way this cartridge is designed makes it useful in a variety of applications such as varmint hunting. 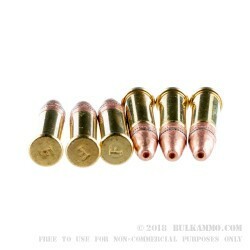 These .22 LR cartridges are constructed using rimfire-primed brass casings. 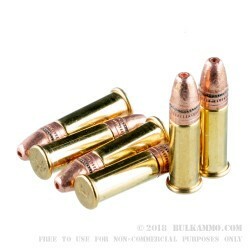 Each casing is topped with a 36 grain copper-plated hollow point projectile designed to mushroom wide to create a drag effect that stops the bullet from passing through its target. These rounds have a light recoil due to the muzzle velocity of 1250 fps and energy of 125 ft/lbs, so this is great ammo to use when teaching new shooters. Since 1922, Federal has cultivated a reputation for excellence with their consistently high-performing ammo. Order your bulk case of this .22 LR ammo today!